One of the most overlooked technique is using the EQ to add size to an element, which is particularly important in sparse mixes. 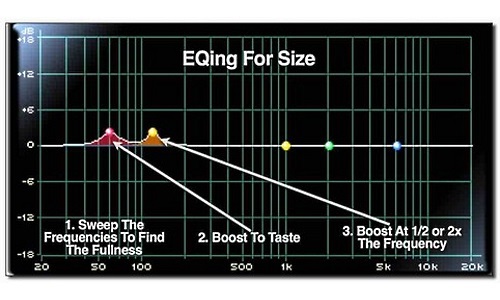 There are many reasons for adding EQ to a mix. EQing for clarity, resonant frequency EQing, and frequency juggling immediately come to mind. That said, one of the most overlooked technique is using the EQ to add size to an element, which is particularly important in sparse mixes. Here’s an excerpt from the 4th edition of my Mixing Engineer’s Handbook that shows how. Since each specific song, arrangement, instrument, and player is unique, it’s impossible to give anything other than some general guidelines when it comes to equalization methods. That said, there are a number of methods that can quickly and easily get you in the ballpark, as long as you know what you’re going for. Remember that different engineers have different ways of arriving at the same end, so if the following doesn’t work for you, keep trying. The method doesn’t matter, only the end result. Listen! Open up your ears and listen carefully to all the nuances of the sound. Everything you hear is important. Make sure you’re monitoring at a comfortable level—not too loud and not too quiet. If it’s too quiet, you may be fooled by the non-linearity of the speakers and overcompensate. If it’s too loud, certain frequencies may be masked or overemphasized by the non-linearities of the ear itself, and again you will overcompensate. Making a sound bigger or larger than life usually comes from the addition of bass and sub-bass frequencies in the 40Hz to 250Hz range, although most will come from an area just below 100Hz, a region just above 100Hz, or both. To use the method, the low-frequency band of your EQ must be sweepable. Set the Boost/Cut control to a moderate level of Boost (8 or 10dB should work). Sweep through the frequencies in the bass band until you find the frequency where the sound has the desired amount of fullness. Adjust the amount of Boost to taste. Be aware that too much Boost will make the sound muddy. Go to the frequency either half or twice the frequency that you used in Step 2 and add an amount of that frequency as well. Example: If your frequency in Step 2 was 120Hz, go to 60Hz and add a dB or so as well. If your frequency was 50Hz, go to 100Hz and add a bit there (see the graphic on the left). That should make the element sound larger than before. Don’t add too much though, since it’s very easy to make the sound too big and muddy sounding! You can read more from The Mixing Engineer’s Handbook and my other books on the excerpt section of bobbyowsinski.com.